Blackpool Open-Top Balloon 706, named Princess Alice, is seen here at Pleasure Beach on 7 September 2003. Blackpool Open-Top Balloon 706 was restored into its Original Green and Cream livery in 2003 after a number of years in advertising and standard green and cream liveries. 706 spent the first 46 years of its life living an unspectacular life as 'just another' Balloon operating seasonal specials on the Prom and after the late 1950s to Fleetwood. But all of that was to change forever on 22 July 1980 (the day after the birth of your webmaster!) when 706 collided with its sister 705 at the Pleasure Beach. The damage to both trams was quite severe with 705 coming off worse, with the tram having to be scrapped in October 1982, over 2 years after the event. However, luckily for us, the powers that be decided that 706 was not beyond repair and so it was stored at the rear of the old Blundell Street depot. The story on 706's future does not end there, however, as in November 1982 the old depot was closed and 706 was moved into the bus yard and seemingly towards the great tram heaven in the sky. The future did look bleak for her when a fellow escapee from Blundell Street, Brush 638, was scrapped in the bus yard during the early part of 1984. The decision was taken at this stage that 706 would be restored to a near original open-top condition in time for the 1985 Tramway Centenary. 706 was originally one of a batch of 7 open-top trams delivered from English Electric in Preston to Blackpool for entry into service during September 1934, as part of the initial follow on order to the prototype streamlined trams unveiled previously. For the first few years of its life the tram remained as an open-topper, as was intended as the trams were envisaged as the replacements for the Dreadnoughts. However it, along with all of its First-Series sisters was fully enclosed during World War Two, around 1941/2. 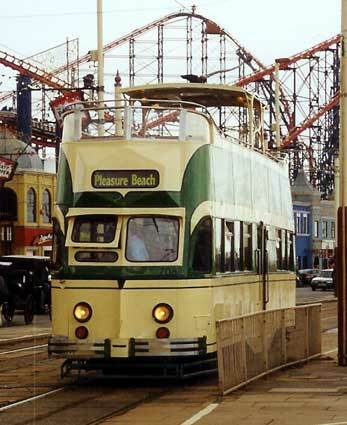 The tram then continued in mainly summer season use as a mass crowd mover mainly along the Promenade, and then from 1958 journeys as far as Fleetwood, when double-deckers were allowed to travel on the stretch from Cleveleys after the fitting of a check rail. The tram never carried any advertising liveries before its accident. The work on restoring 706 as an open-topper began around Easter 1984 with the tram being stripped and the remains of the top cover removed for a start to be made. 706 was never destined to be restored to a complete original state as health and safety matters had to be taken into consideration and Blackpool Transport had to have its as economic to run as it would not be going to a museum. The obvioius modern touches at the time were the fitting of the standard pantograph vice a trolley and the retention of single destination blinds rather than the original twin versions. Boat Car 603 donated some parts to the trams restoration including the upper deck seats, which were returned to their wooden state rather than the standard seats 706 had been fitted with during a previous overhaul. The trams restoration was completed by April 1985 when it was transferred to the paint shop for the application of the original Green and Cream livery style, and the tram was returned to service for the May Bank Holiday in Centenary year. Then during the centenary celebrations the tram was named Princess Alice by the lady herself, the name has been carried in a variety of ways since this day. In the 18 years since the return of an open top Balloon, 706 has worn 4 different styles of livery. Until 1989 the Original Green and Cream was carried and then in May of that year it received an all over advertising livery for the Coral Island on the Prom. It carried this advert until May 1992 when the advert changed to that of Gala Bingo in a paleish design, far duller than the original Coral Island version. Then in June 1994 the tram received the then standard Green and Cream Balloon fleet livery. Finally in July 2003 the tram was back into the Original Green and Cream style, at the same time receving windscreen hoods and wood Princess Alice nameplates, with the tram returning to service on the 21st - 23 years and a day since the accident that caused it to become a celebrity tram.